Taoism (or Daoism) is one of the main strands of traditional Chinese philosophy. It gets its name from the idea of the Dao, which means “the way,” which is the reality beyond human perception, a reality that Taoists strongly associate with the natural world. For Taoists, the ultimate goal of human life is to understand this reality and learn to live in harmony with it. One of the main beliefs of Taoism is wu-wei, or “not doing.” Taoists believe that the path to wisdom and happiness involves emptying the mind and settling into a deep stillness. Like Buddhists and Hindus, Taoists practice intensive spiritual meditation as a method for understanding the world and living a better life. 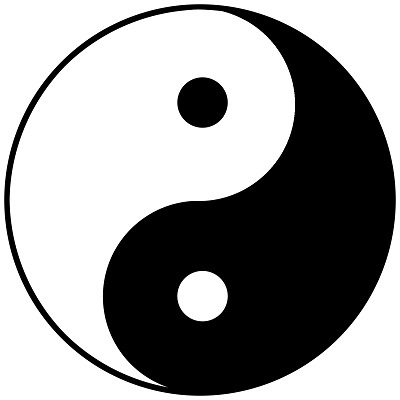 Taoism is strongly associated with the yin-yang sign, which symbolizes the Taoist belief in matched opposites: light and dark, hot and cold, wet and dry, masculine and feminine. However, the real point of a yin-yang symbol isn’t just the black and white halves – it’s also the fact that each half contains part of the other! The black side has some white in it, and the white side has some black. This is a central belief in Taoism: that even though the world is made up of matched opposites, it’s not a simple matter of “this vs. that.” Moreover, there is no ethical dimension here: light is not “better” than dark just as summer is not “better” than winter; they are just different. In Taoism, good and evil are illusions. Taoism is often listed as one of the major world religions, but many of its adherents don’t consider themselves to be followers of a “religion.” This has caused some debate about whether Taoism should be considered a philosophy or a religion – a debate that doesn’t really make sense in the context of Chinese culture (see section 7). How can justice and social order be preserved? What are our duties and responsibilities in life? What does it mean to be a good parent/student/friend, etc.? What is the true nature of existence? What can people do to be happy? So Taoism and Confucianism are not competing philosophies. Rather, they are different viewpoints that focus on different problems. Traditional Chinese culture has been richly influenced by both of these traditions. Historically, there has been some conflict between Taoism and Confucianism – at various periods, Confucian reformers tried to change the Taoist religious practices of the Chinese empire. Where Taoists believed in a wide range of rituals, gods and goddesses, and mystical ideas, Confucians tended to be more rational (or more narrow-minded, depending on your perspective) and suspicious of traditional rituals and the priestly class of religious Taoists. This is one of the most famous lines from the Dao De Ching or Tao Te Ching, (see section 7). Like many of the lines from this book, it uses a simple image from everyday life – something everyone can relate to. But its philosophical message is profound, and not easy to understand if all you do is look at it on a page. Instead, you have to live this idea. In everyday life, try to be an empty bowl, and over time you may come to understand the wisdom of the idea. “The clouds above us join and separate. Taoism was founded by a philosopher named Laozi (LAO-dzuh) who lived in China some time around 400 BC, right around the same time that Aristotle and Plato were laying the foundations for Western philosophy. Or did he? Many historians argue that there was no historical figure named Laozi: the name means “Old Master” or “Wise One,” and it’s possible that the early Taoists simply attributed their philosophy to a fictional or metaphorical figure named Laozi. On the other hand, there are other historians who argue that Laozi was a real person. The Dao De Ching was an important text for the people of classical China, and its ideas were richly integrated with the traditional religions of the region – in fact, they’re so closely linked that there’s a historical chicken-and-egg problem as to whether the religion brought about the book or the book brought about the religion. Either way, the Dao De Ching was treated as an important religious text – even though it doesn’t talk in any detail about gods or goddess, the afterlife, or other important religious topics. Taoism became the official religion of China for over a thousand years, ending in 1911. Taoism in China suffered a serious blow in 1949, when the Communists came to power. Some Communists (though by no means all) believed that traditional Chinese culture needed to be erased so that China could be reborn for a new age. Remember that China had just suffered the trauma of a brutal invasion by the Japanese, and this pain and shame probably contributed to the desire for a complete break with the past. During this period, many Taoist temples were ripped down, monks were arrested, and ancient copies of the Dao De Ching were burned. Today, however, Taoism is slowly recovering from this violence, and it continues to be influential in traditional Chinese culture. Kung-fu legend Bruce Lee always said that Taoist philosophy was a major influence on him – both in terms of his martial arts and his acting. Like Laozi himself, Bruce Lee used images drawn from nature and everyday life to explain his philosophical ideas. Something as simple as a cup of water can have deep philosophical significance, in this case illustrating the importance of being adaptable and fluid in every situation. Star Wars shows many influences from Taoism, especially in the teachings of Yoda. Some people have also pointed out that Luke Skywalker and Darth Vader correspond to the yin-yang symbol: they are matched opposites, and yet there is some darkness in Luke (represented by his black-gloved right hand) and some good in Vader. There’s a big problem with seeing Vader and Luke in terms of the yin-yang, though: their conflict is all about good vs. evil, concepts that don’t exist in Taoism! Is Taoism a religion or a philosophy? This is a very tricky question for several reasons. For one, philosophy and religion are actually quite difficult to separate logically. The problem is especially complicated in non-Western culture, where the idea of “religion” has a very different meaning, if it exists at all. In the West, we tend to view every religion on the template of Christianity: we look for its church institutions, its central prophet, its holy text, its articles of faith, its god(s), etc. But it’s a mistake to assume that every religion has this sort of structure. Religion is a complex combination of faith, culture, philosophy, and personal rituals, and there’s no cut-and-dried definition that works in all cases. Non-Western religions tend to be particularly philosophical in outlook, and their beliefs are more fluid than those of Western religions. In some books and articles, the author will draw a distinction between “religious Taoism” and “philosophical Taoism.” Religious Taoism consists of the various rituals and spiritual exercises that Taoists (especially Taoist monks) practice; philosophical Taoism consists of the major philosophical works written down by influential Taoists over the years, and the body of ideas that they have developed. This distinction can help us understand Taoism better from our own perspective by dealing with the religion/philosophy question. However, it’s important to remember that in Chinese culture there is no philosophical or religious Taoism – there’s just Taoism, and the philosophy and rituals are all part of the same ideology. Which of the following was a Taoist quote? great , thank you for the effort. great help.